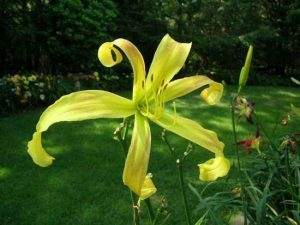 A spider daylily must have a petal ratio of at least 4:1. That is, the length of the longest petal (usually the bottom one) must be at least 4 times its width. Here are two methods of measuring a spider daylily. The first method is an easy way to determine if the flower meets the minimum 4:1 ratio and can be done with the flower “on scape” without destroying the flower. Measuring the petal width is the same for both methods. The blossom should always be “on scape” for this measurement. Lightly lay a ruler across the longest petal at its widest point. 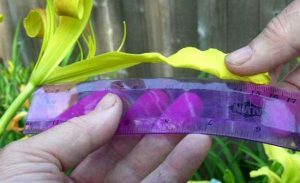 The ruler should barely touch the petal, so as not to flatten the petal and change the width. Here the petal width is 3.1 centimeters. In order to be a spider the length must be 4 times 3.1, or at least 12.4 centimeters. 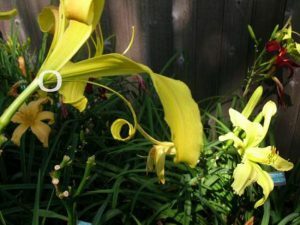 In the “on scape” method, the length of the petal is measured on the scape from the “V” where the sepals separate – indicated by the white circle above. 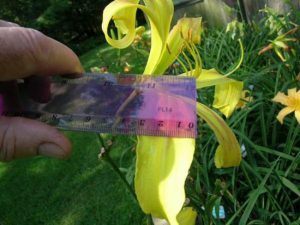 Place the end of the ruler in the “V” where the sepals separate and gently extend the end of the petal out as far as it easily will go along the ruler. See if it passes the 12.4 mark on the ruler. If it does, then the flower is a spider. 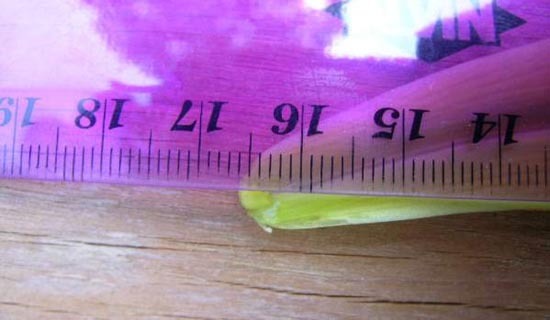 Here we see the length is 15.8 centimeters, so the petal exceeds the 4:1 ratio of 12.4. 15.8 (length) divided by 3.1 (the width) = 5.09. By this method the spider has a ratio of 5.09:1. This is the most accurate measurement. Hybridizers should use this method when registering their introductions. Using the same procedure as the “on scape” method, measure the width of the longest petal at its widest point. Then remove the blossom from the scape. 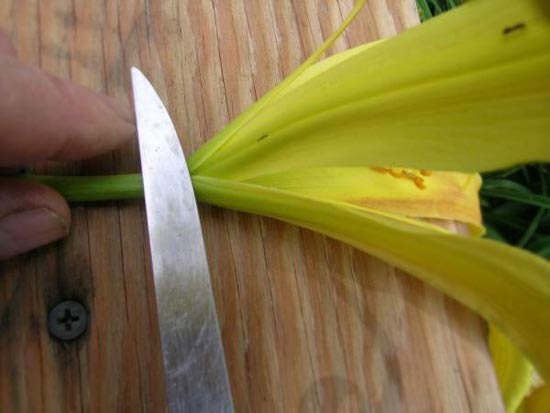 Cut the petal away from the base of the flower at the “V” notch where the sepals separate. 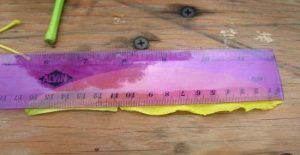 Lay the petal flat on a surface and lay the ruler on top of it. That way the measurement of the length will be exact. We see that the exact length is 16.6. The width remains the same – 3.1. The ratio is 16.6 (length) divided by 3.1 (width) = 5.35:1. That is more accurate than the “on scape” method which arrived at a ratio of 5.09:1. However, the difference is less than 5%. So, the “on scape” method is pretty accurate, and, in most cases, it is an easy way to determine if the blossom meets the minimum 4:1 ratio.